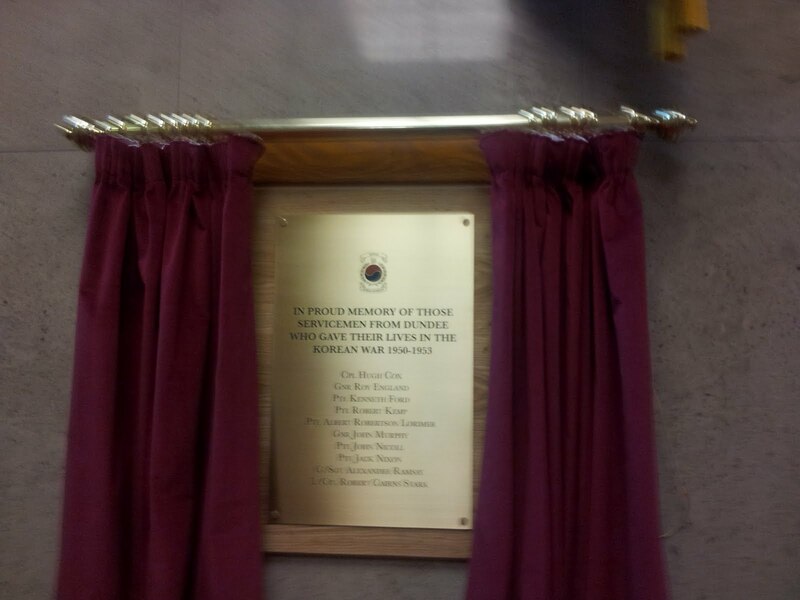 On Friday afternoon I was pleased to attend a short ceremony where a Memorial was unveiled to those men from Dundee who died in the Korean War. The Korean War is often a forgotten conflict but I do think that it is important to remember these young men, mostly if not all on National Service. They went far from home to fight in support of a UN mandate. It was good to see veterans and also family members at the ceremony. We should do all we can to promote peace and justice in the world but we must also support and remember those who made the ultimate sacrifice in the service of their country. The memorial is just inside the entrance to the City Chambers. Co-ops: An answer to crony capitalism? I am a member of the Co-operative Party and also of the Christian Socialist Movement. 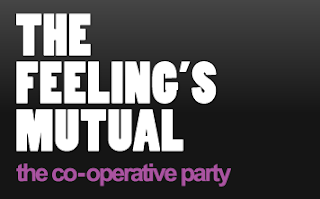 Recently I was asked by the Christian Socialist Movement to write a blog on co-operatives. You can read the blog post here. I do think that co-operatives do offer a real alternative and that their time has come. I welcome the reassurance which I've received from the City Council's Education Department that school crossing patrollers will be in place from day one when the new primary schools and nursery school open on Blackness Road in October. I am pleased that I have received reassurance from the Education Department that school crossing patrollers will be in place when the new schools open on Blackness Road in October. I was concerned when I recently heard that 18 crossing where currently without school crossing patrollers. I have been told that the current crossing patrollers serving the schools will move when the new campus opens. I am pleased about this. I will be keeping a close eye on this when the schools open. 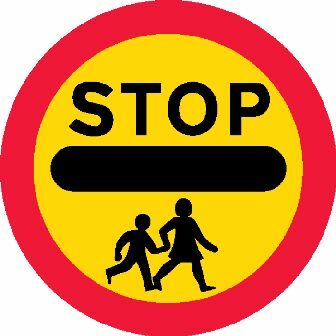 I know that it is an ongoing problem that does not only happen in Dundee but we need to look at ways of ensuring that enough school crossing patrollers are in place. Tonight I attended the National Holocaust Memorial Event which was held this year in the Caird Hall. This was a really challenging and moving event. I was pleased to meet with some of my old friends from The Scottish Inter-Faith Council and Action for Churches Together in Scotland. All those who put the event together deserve a great deal of praise. Rabbi Bent Melchior spoke movingly of the story of the Danish Jews who were mostly saved from the Concentration Camps largely through the efforts of the Danish people. He spoke about not hating and looking to find ways to ensure that such hatreds are not allowed to rise up in the future. The 'Do Your Thing' Dance Group performed a challenging piece. Two Grove Academy pupils told of their recent visit to Auschwitz. It was good to hear the voice of local young people who had taken the time to visit this site with support of the Holocaust Educational Trust. These pupils, who did a fabulous job of their presentation, told how they were sharing their experience with other students in their school. We also heard about Inside Hana's Suitcase from Fumiko Ishioka, George Brady and Lara Brady. This told the story of George Brady's sister Hana who was murdered in Auschwitz. This was incredibly moving and it was heartbreakingly sad to hear about the story of this little girl of 13 years of age who was killed by the Nazis who wanted to be a teacher and whose story is now, so many years after her death, teaching young people about the need for tolerance, justice and equality. There was then a brief memorial service which concluded what had been a fascinating and troubling evening. The Holocaust Memorial Trust are asking people to 'Speak Up Speak Out'. We should speak up against hatred and discrimination. I've signed the pledge to challenge the language of hatred and commit to using words which reflect respect for the dignity of all human beings. You can sign up here. You can watch the video below about the power of our voices. The Administration of the City Council has issued its draft capital plan. The plan can be read here. I would be very interested to hear your views on these proposals. The biggest spend in the West End would be the refurbished Harris Academy, which is re-announced again. There are a number of areas where it is important to look at the detail of these proposals and I will be seeking to meet with council officers over the next few days to discuss issues around this plan. It is worth noting that there is an election on the horizon and suddenly the council has awoken out of its inertia and appears to have noticed that there are needs across the city which need to be met. The Labour Group will be examining these proposals. We will certainly be looking for details, I was going to say more details, but there is virtually none at the moment. On Tuesday evening I attended a meeting of the board of Dundee Rep. There was a good discussion about the future programme. It was good to hear about the symposium on pathways into the arts for disabled people. I am sorry that I was not able to attend any of the events associated with this as it seems to have been very successful. 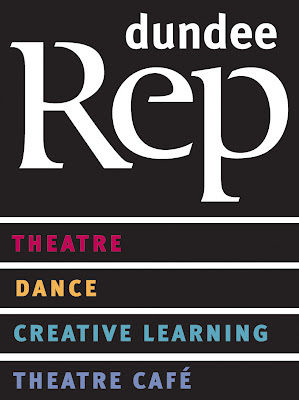 There is a lot happening at the Rep over the next few weeks, which I am sure will be worth seeing. There is a Play, a Peh and a Pint performance at Discovery Point; Scottish Dance Theatre and towards the end of February the Ensemble perform Steel Magnolias. Monday night saw a variety of City Council Committees. First up was the Education Committee, this includes the school holiday dates for the 2013/14 term. This is obviously useful to parents and helps those who want to book their holidays early! There was also a report on the proposed extension to Kingspark School, I welcome this as Kingspark does a great job and should be supported as much as possible. It is unfortunate that decisions were made without reference to elected members but what is important now is to deliver the best facilities possible to children in Dundee. The Education Department also withdrew their proposals for a uniform 33 period week in secondary schools. We were told that this was essential to deliver the Curriculum for Excellence, if it is not going to happen then what are the Education Department doing to ensure the effective delivery of Curriculum for Excellence? We can't let young people miss out while the Education Department works out the way forward. The City Development Committee considered a wide range of issues. It included a report on the redevelopment of the Highgate and surrounding area in Lochee. This is an important issue for the city and for people who live in the north of the West End ward who sees Lochee High Street as their local shopping centre. I will be keeping a close eye on this along with my colleague Councillor Tom Ferguson to ensure that the heart is put back into Lochee. The Social Work and Health Committee looked at future support for adults with a learning difficulty. Importantly this report has been influenced by the views of service users about the services which they needed and wanted. This is how services should be provided with a balance between the views and needs of service users and the professional opinion of council officers. The Policy and Resources Committee considered a number of reports that had been worked on at the secretive Changing for the Future Board. Including one on how the council deals with mail, this praises the earlier decision to transfer the council's mail to the private sector. This is ironic since councillors want to be able to criticise the performance of the Royal Mail and the Post Office but don't see the contradiction that they have voted to add to the Royal Mail and the Post Office's problems. The Housing Committee set the rent rise for council tenants for next year. After consultation with tenants the council house rents will rise by 4.75%. Unusually there was also a Development Management Committee meeting after these service committees. The Development Management Committee considered an appeal of sorts from a property owner who wanted to be allowed to turn townhouses in Larch Street into Houses of Multiple Occupation (HMO). When planning permission had been granted for this development the developer had agreed to a voluntary legal agreement known as a Section 75 agreement which meant that the houses could not be used as HMOs. There is an important issue that these entirely voluntary agreements are really useful in planning terms and can be used to protect the nature of communities in the city. If the council relented on this it would open up the floodgates and render these agreements worthless. In this instance the property owner is saying that they have not been able to make enough money on these properties. This is in some respects a product of the current economic situation. I wonder if the owner had been making enough money whether they would have contacted the council to make a donation out of their profits? I doubt it! Property developers and owners should take the risk in their business it is not the council's role to provide some kind of safety net. HMOs are very important in the West End they provide standards and safety for people renting properties; they also ensure standards and provide some reassurance about safety for adjacent properties. It is also important that the West End maintains a balance between student accommodation and family accommodation. At the weekend I attended the opening of the latest exhibition at the DCA by Jane and Louise Wilson. 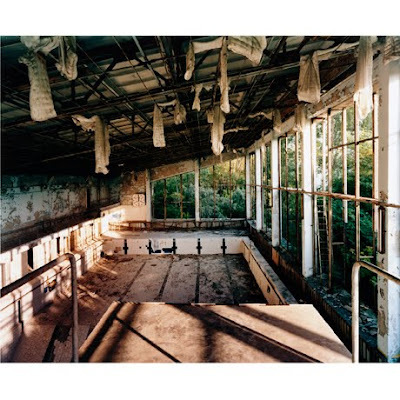 This includes some challenging photographs from the town of Pripyat which is within the exclusion zone around Chernobyl. The photographs show the hurried way in which people left the area. The one here shows a swimming pool. The DCA is a great resource for the city. This exhibition is on until 25 March and is worth a visit.